VietPress USA (June 15, 2018): Last week, on Sunday, June 10, 2018, thousands of Vietnamese protesters took to the streets in different parts of the country to demonstrate against a government bill to allow Chinese investors to lease 3 important large areas at 99 years for special economic zones including Van Don in Quang Ninh province, Bac Van Phong in Khanh Hoa province and Phu Quoc in Kien Giang province. On January 19, 1974, China has invaded the Paracel Islands on the East Sea of Vietnam that China calls the South China Sea. The invasion took the Paracel Islands after a deadly war between the naval forces of the People's Republic of China (PRC) and South Vietnam on January 19, 1974. The battle was an attempt by the South Vietnamese navy to expel the Chinese navy from the vicinity. n 2014, China seized the Spratly Islands and drew increased international attention due to its dredging activities within the Spratlys, amidst speculation it is planning to further develop its military presence in the area. In 2015 satellite imagery revealed that China was rapidly constructing an airfield on Fiery Cross Reef within the Spratlys whilst continuing its land reclamation activities at other sites. China now already built up 7 manmade Islands for military bases on East Sea and controlled almost 90% of sea water of Vietnam. China's Navy killed many Vietnamese Fishermen, seized their fishing boats, fishnets and belongs but Vietnam Communist Government keeps silence. It is now, Communist Party and Government decide to lease 3 large areas for 99 years to China and this is the invasion scheme of China to invade the mainland and dominate the people of Vietnam. Vietnamese people believe that Communist Party and small group of leaders sold the lands to China and betray the Country. For this reason, people struggled against communist government with thousands protesters took to the streets in many parts of Vietnam. William Nguyen who is a Vietnamese American student on his vacation in Saigon, joined the protesting with crowd and has been arrested by Communist Police. The Vietnamese American communities in the United States organized the rallies to urge the U. S. Government to ask Communist of Vietnam to immediately release William Nguyen without any conditions. The US has urged the Vietnamese authorities to release one of its citizens who was among dozens of people arrested during violent protests last week. Will Nguyen, 32, a Yale graduate who comes from Houston, Texas, was visiting Ho Chi Minh City, en route from the US to Singapore, where he was due to graduate from a master’s programme in July. 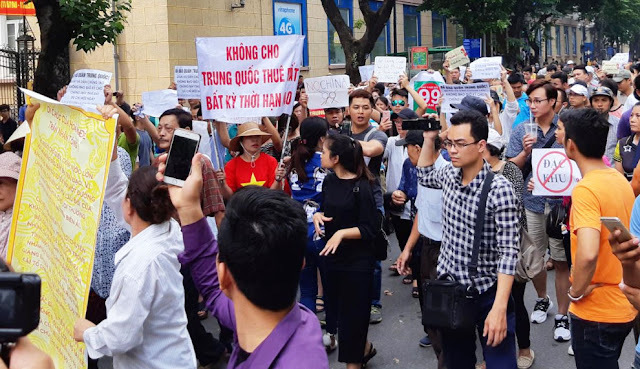 According to a statement released on Thursday on behalf of Mr Nguyen’s family and friends, he was “beaten over the head and dragged into a police truck” after joining a rare demonstration on June 9 against proposed special economic zones that have raised fears of Chinese encroachment. A video linked to the statement allegedly shows Mr Nguyen being dragged along the street with blood streaming from his face. He is later shown standing on the back of a police pickup truck. Vietnam’s Communist government bans anti-government protests and public gatherings must be approved by the authorities. 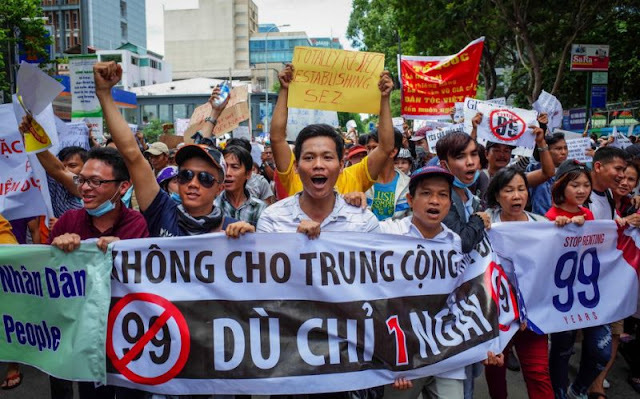 However, demonstrations erupted over the weekend over planned special economic zones that would give leases to foreign investors with less red tape, stoking fears that national security would be undermined by giving China control over Vietnamese territory. Before he was arrested, Mr Nguyen was live-tweeting from the protest, revealing that events had taken a nasty turn after police had allegedly struck a man, who was seen in lying motionless on the ground. It said the authorities had confiscated his laptop, passport and credit cards from the AirBnB property where he had been lodging, and that he had been falsely accused of being a member of the reform-focussed Viet Tan political party, which is banned in Vietnam. This was “not plausible” said the statement. “The diplomatic protocol is that the Vietnamese have 48 hours in which to notify the US embassy that one of its citizens has been detained, but this has not been adhered to in the current situation,” it alleged.